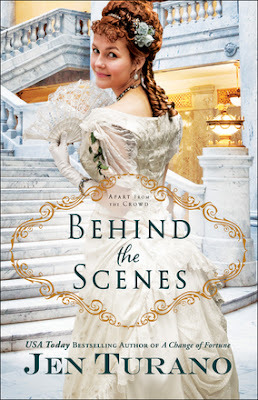 I recently finished reading Behind the Scenes by Jen Turano, the first book in the Apart from the Crowd series. Set in New York City in the Spring of 1883, the story centers around Miss Permilia Griswold and those around her. A known wallflower, Permilia has a way of blending in and going unnoticed amongst members of society, until at the Vanderbilt Ball where she suddenly finds herself the recipient of additional attention and it turns into a pivot point in many aspects of her life. Permilia was my kind of girl, able to spend time around society but one who had other priorities and many other things which were more dear to her than the need to be accepted by society. In good part, Behind the Scenes was a story of acceptance - acceptance of others, acceptance of self, acceptance of God's plan and acceptance of family and past. Permilia had plans for her life and being part of New York society was never on her list, but as the story unfolds and she faces many challenges, she finds herself visiting with Reverend Perry who reminds her that 'some of our life experiences should be looked upon as stepping stones, needed in order to cross the stream at large, but not meant to be lingered on' and that sometimes we have to turn our troubles over to God and be willing to accept what He may have in store for you. It was only after that pivotal conversation that she seemed to come to accept the changes that were happening and really found a path to happiness. I thoroughly enjoyed Behind the Scenes. The author did a great job setting the scene and establishing the development of the characters through the backdrop of the Vanderbilt Ball, including details on the clothing, dancing and other details of the ball. The book drew me in from the beginning and surprisingly, with almost 1/3 of the book focused of establishing the situation and characters at the ball, the story never slowed. There was a great mix of love, intrigue, mystery and suspense within the story through which the reader grew closer with the characters and the challenges that they faced and successes that they achieved. I really look forward to the next book in the series, which I am sure will cast light onto Permilia's continuing story, as her friend Gertrude is the center of the story. If you enjoy a good love story with a little mystery mixed in, I would recommend checking out Behind the Scenes.